This Land Rover Range Rover Sport is available in Silver, Black, White, Red, Blue other colours and lease options, subject to availability and includes a warranty. The Range Rover Sport has awesome presence, and it's almost as spacious as the Range Rover. It's quicker and less anti-social as fuel consumption and emissions have improved. The Range Rover Sport is very comfortable, spacious, desirable and extremely good on and off the road. Which Land Rover are you going to lease today? We offer top quality Land Rover Range Rover Sport from brand new, nearly new, slightly used or ex demo, whether you have good or poor credit rating, pay a low or no deposit. These Land Rover Range Rover Sport can be leased or financed and come with a warranty, HPI checked and when contract hire leasing, include UK nationwide delivery and AA or RAC Roadside Assistance cover for peace of mind. 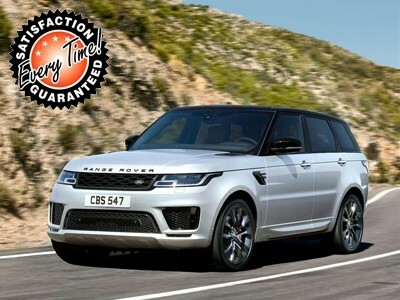 Time4Leasing can offer you the latest Land Rover Range Rover Sport lease deals at lower prices because these vehicles are exclusive and offered at lower rates to customers that have good, poor or even bad credit history score ratings. The Range Rover Sport is Land Rover's answer to driver-focused 4x4s from the likes of BMW and Porsche. The supercharged model best lives up to the 'Sport' name, with sledgehammer power allowing two tonnes of 4x4 to accelerate at a barely credible rate. That's fine for the money-no-object darlings of football's Premier League who are among the Sport's leading customers. For the rest of us, the entry-level 3.0-litre diesel brings reasonable running costs (in relative terms) without making you feel you've sacrificed all semblance of performance. Every model performs well on- and off-road, as well as having a trim befitting of the car. Beware of niggling problems, though. While much improved, Land Rover's old reliability issues haven't disappeared completely. One more thing – make sure you test drive a standard Range Rover as well as the Sport. You may prefer its more genteel nature. There are 40 Land Rover Range Rover Sport Lease Deals on Offer.